The Boeing 777X vs The Airbus A380 – What Plane Wins? With the Boeing 777X almost ready to take to the skies, many are in anticipation on how airlines will use this aircraft. Take Emirates for example, they have 149 Boeing 777 variants in use on their long haul operations, using the vast capacity as part of their strategy to bring as many passengers as possible on the longest routes in the world. When the new 777X version was announced, they were quick to place 120 orders for the latest Boeing offering (35 777-8 and 115 777-9). However… Emirates has quite a number of other aircraft in their fleet, specifically the Airbus A380, the biggest plane in the sky. If capacity is the main strategy of Emirates, then they have it in excess with 109 A380s (and 53 orders on the way) in their fleet. So for an airline like Emirates, what is better? The A380 or the newer 777X? How will we compare the two aircraft? We will be matching each aircraft up against each other and compare them on a variety of different factors, such as seating, range, fuel, cargo etc. We will take on the perspective of an airline, like Emirates, and look at the numbers. Whilst both aircraft might have different passenger experiences (such as more room on a A380 or better pressurization on a 777X) we want to stick to what makes more money for the airline. Unlike in previous comparisons (see at the end of the article for the full list), we will not just ignore another variant of the same plane. As both versions of the 777X have their merits, we should compare them directly to the A380 as if the airline was making a choice between, not two aircraft, but three. Also, there are technically two additional variants, the 777-10 and the A380plus. But as both don’t really exist (although very well might one day!) we won’t factor them in the discussion. This first challange is a bit of a no brainer. Whilst the Boeing does very well with 414 seats on board, the Airbus dominates with over 500 seats. 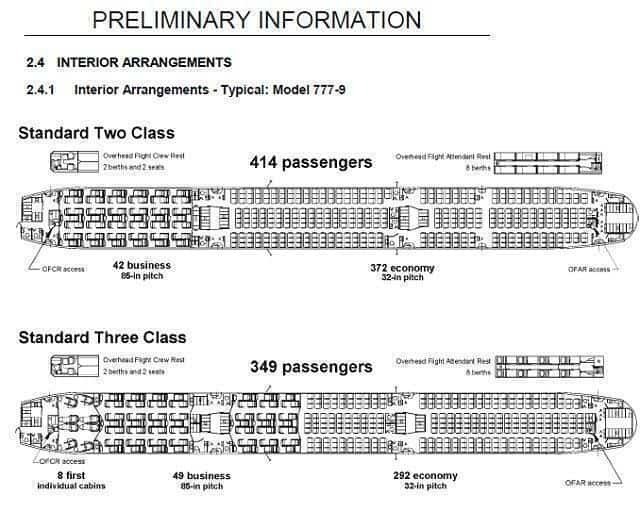 Even looking at a 3 class variation, the A380 just has way more room. This is due to the plane being double decked, fitting in roughly twice the space on board. This extra space goes to comforts like showers, bars and other entertaining spaces that are rare on other aircraft. ANA A380 Seatmap. Notice all the additional areas onboard. Wait, what about fuel efficiency? First, let’s talk about the elephant in the room. The A380 has 4 engines and the 777X only has two. Logically, more engines, more fuel. But it gets a little more complicated when we add in the weight of the aircraft, what materials it is made out of, and general design principles to be as aerodynamic as possible. Built off the back of the famously fuel-efficient Boeing 787, the 777X reaps all the hard work. This graph keeps on giving. 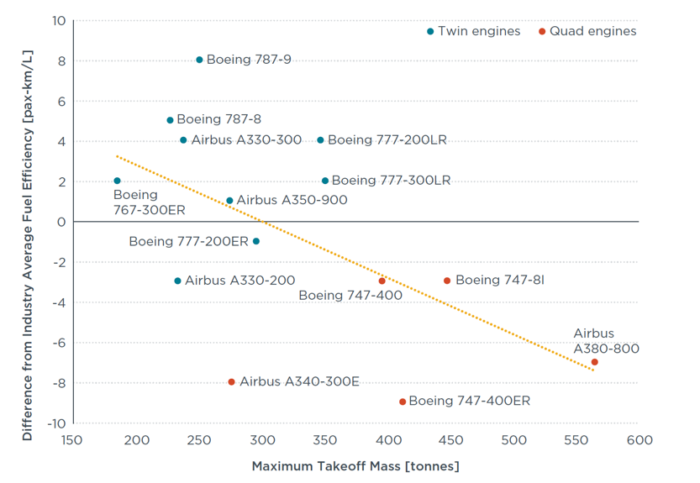 777X would be near the 787 on this graph as it uses much of the same technology. So far the 777X has not flown on any routes yet, so it’s hard to say what it’s the actually useful range for the aircraft. The A380 however, has proven itself, flying from Dubai to Auckland on the world’s fourth longest route. 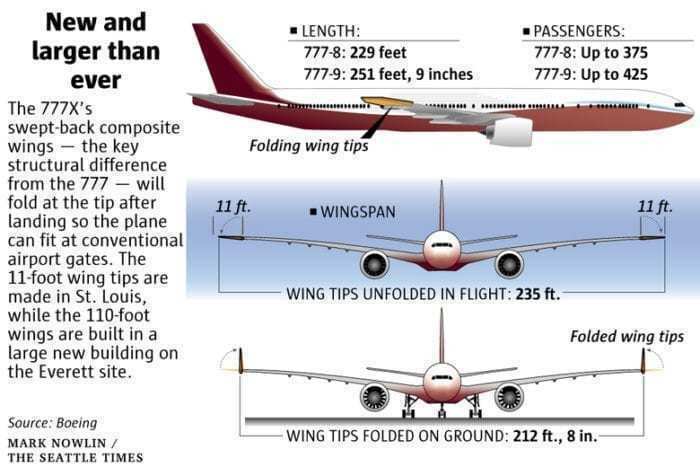 This is also where the two variants of the 777X come into play. The 777-8 has a range of 8,690 nmi, beating out the Airbus A380’s range of 8,000 nmi. But the 777-8 does not have the capacity as large as the A380, and thus might not be as useful. Speaking of useful, are there any routes where the 777-9 would not be used in lieu of the longer range of the A380 (a range of only 500 nm)? Unlikely. Because so few orders are being made for the A380 (and one of the main reasons why it will soon be discontinued), it’s costs are higher. 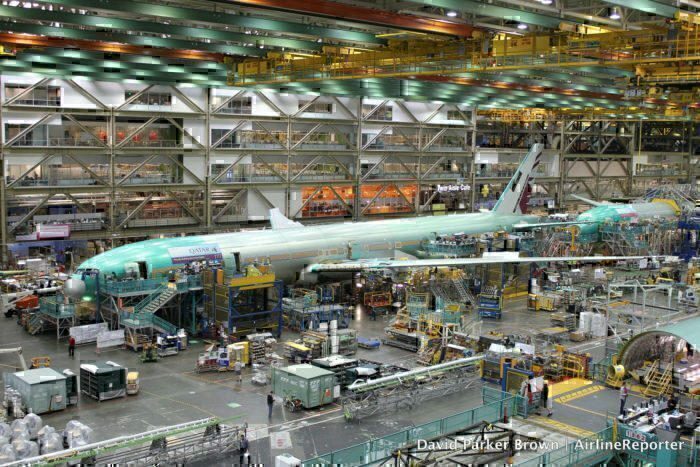 As so many orders are being placed for the 777X series, costs can be spread over the production line (economies of scale). It is far easier to fill up a smaller plane and fly it frequently. than hoping you can fill a giant plane and fly it less frequency. The typical A380 needs to have plenty of premium paying customers to make a profit, whilst a 777X needs less. Plus, the A380 can’t fly everywhere. A perfect example is Dubai to Cape Town, South Africa. If Emirates flew an A380 there, it would have to stop at Johannesburg and an additional plane would fly the extra distance to the cape. Whilst by using a 777X, it can fly directly to Cape Town with no additional aircraft required. This extra cost would easily beat any profit made from the extra passengers on an A380. The Boeing 777X simply is a better aircraft for this modern world. 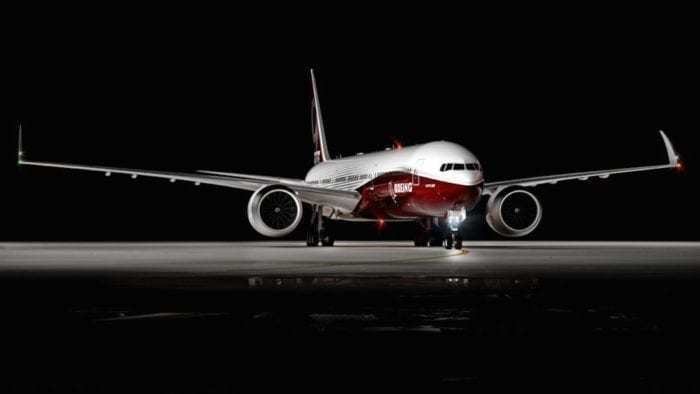 Factoring in fuel efficiency, range, cargo capacity and cost to buy, the 777X simply is a better deal for airlines. Thanks for reading and be sure to let us know if we missed anything in the comments. What a nonsensical comparison … these are two distinctly aircraft in two distinctly categories. Apples to oranges …. Hey Jeff, thanks for the comment! What two categories do you believe that they should belong to? A380 – hub to hub? 777X – Hub to Spoke? Nick, You can’t expect us to take your article seriously when you can’t even add 115 and 35. Besides, Singapore airlines was the last airline to order the B777x and that was in 2017 (two years ago). They are hardly selling like hot cakes. The A380 has outsold it in the last year. At the end of the day, something like 225 of the 326 orders for the B777x come from the ME3 carriers and there are only something like six carriers that have ordered the aircraft. Glad you bring the hub into the conversation, since I thought it was all about point to point which never really materialized. Hubs will always be the predominant model. Your comparison seems to have a rather large omission – passenger preferences. I don’t know anyone who flies long haul regularly who doesn’t rate the A380 head and shoulders above the 777 ER. The 14 hour return by 777 was a very poor experience. Small Business Class section , cramped. No where to walk. Noisy and turbulent. As an Emirates pilot told me, the bigger and heavier the plane the better it combats turbulence, rather like a large liner in rough seas, over a rowing boat! But I suppose it’s all about profit for the industry. Spot on Brian. I am a regular A380 traveller (at least 30 flights on that type alone per annum, a third of them on the Dubai-East Coast Australia-Dubai 14-hour non-stops). I have flown all three classes (First Class on upgrades – never at my own expense I have to concede) on these legs. I have my own business so will normally always fly Economy. Emirates’ A380 Economy is very bearable, far more so than can be said for the B777 and A330 on the same legs. My travel agent has been in her business for 40 years. She tells me that the A380 is the only aircraft that return customers ignorant of aircraft models will actually specify by name when making travel bookings. Yes, she does find it amusing that some of her clients ask to fly A380 on domestic UK flights or short hops from UK into Europe and return, but the takeaway here is indeed “customer preference”. Today there is no A380 peer from a passenger perspective, but, as you conclude, there’s sadly no room for a passenger-friendly airliner like the A380 when more economical but less comfortable airliner options are available to the airlines. It would be wonderful if the B777X proves me wrong! Really? Has anyone actually googled the # of orders for the 777X? Hint: 326. That’s it. The A380 started with something like 340 orders. Oh, and just like the A380, the vast majority of orders for the 777X comes from the 3 Middle-Eastern airlines. Also, take this: 30 orders since 2014. Last order in June 2017. Ouch! Now you understand why Airbus decided against the A350-1100 or A350-2000 or whatever they were going to call it? Interesting article. However, I believe the cabin width is incorrect. You state the cabin width of the A380 at 5.80 meters and the 777X at 5.96 meters. I would have added passenger comfort (something the airline industry tends to ignore nowadays) to the analysis and there Airbus beats Boeing big time with A380 and A350. In both aircraft you can HEAR people chatting during takeoff. From this perspective the B787 is a big disappointment. Its cabin is as noisy as an old B767. On the other hand the era of quad jets is gone, this is not a question anymore as fuel efficiency is getting more and more important. You can’t compare these two aircrafts! Emirates use the 777Xs to replace the older 300Ers. 777X main competitor is A350. If you want to compare the A380 with something, it would be the 747-8. A quick reminder to everyone: 777X arrival has NOTHING to do with A380s replacement. New A380s to be delivered from 2020s will replace the old ones! GBP200 million per landing slot. Yep makes sense to increase the frequency. I can make the money up in no time. And please don’t bring up the Sonic Cruiser comparison, since that was the initial response from Boeing to the A380. Emirates have four seating versions of their A380. 20 are in a two class layout with 615 seats. The width of the passenger cabin is 21ft 6ins. 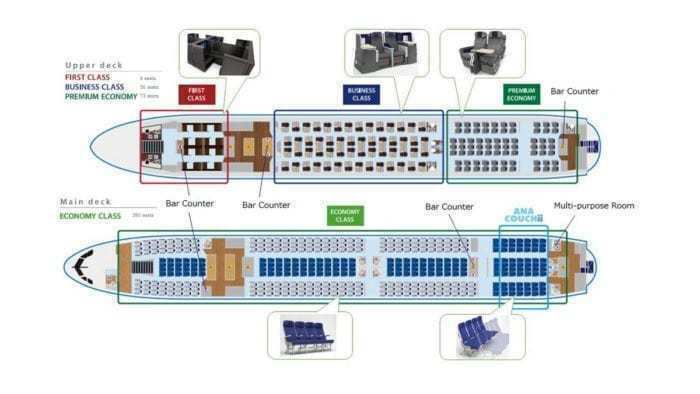 It is also possible to go to 11 abreast seating and still have an 18 wide seat. The passenger experience on the A380 is way above the 777 and brings additional revenue and prestige that other airlines and aircraft cannot match. The operational costs such as staffing, slick route network planning etc is a far bigger factor in overheads than just fuel. The weight of the 777x will mean it will be under the line of the rather simplistic average fuel efficiency graph especially on the majority of long haul flights. Let me put it VERY SIMPLY for you. The 777-9 is an empirically more efficient airplane than the A380. Here are the numbers. The A380 has a Maximum Take-off Weight (MTOW) of 575 tons, of which up to 14.6% (84 tons) can be payload and 46.0% (265 tons) can be fuel. The A380 also needs a ton of thrust to get every 3.94 tons of its MTOW into the air. The 777-9 has a MTOW of 352 tons, of which up to 20.9% (73.5 tons) can be payload and 46.0% (162 tons) can be fuel. It only uses a ton of thrust per 3.68 tons of MTOW. It is easy to see that the 777 has a similar fuel fraction and a much better payload fraction, while having a lower thrust requirement per ton. It is therefore a more efficient airframe independently of the superior efficiency of its engines. concerned about these thousands of flying monsters polluting the skies!! There really must come a time to ask: ( IS YOUR TRIP REALLY NECESSARY) now that electronic communication is so simple? but i think a350-1000 is more efficient again than the 777-9. Thanks for the article – just one thing, though – I see the flying distance from Dubai to Cape Town is a little under 5000 miles, yet you mentioned that an A380 cannot make the journey without refuelling. Are you sure about that? Generally, all that I am able to deduce from this huzzle and rally between Airbus and Boeing to manufacture new brands of Airbus A350 and forthcoming Boeing 777x is just a huzzle to drive the aeroplane fashioning trend and ideological competition. Correct me if am wrong, Boeing sampled her first B777 at the 1996 Farnborough Airshow. This airplane won the glory of that day because it can seat and carry more than 330 persons on air and practically fly on one of it’s electro mechanically powered twin engine for five hours or more then switch on to the next engine to fly for another five or more hours, it only uses the two engines for take off and landing basically. Additionally the Boeing 777 can not drown in high sea because it is originally built by Boeing to dive. 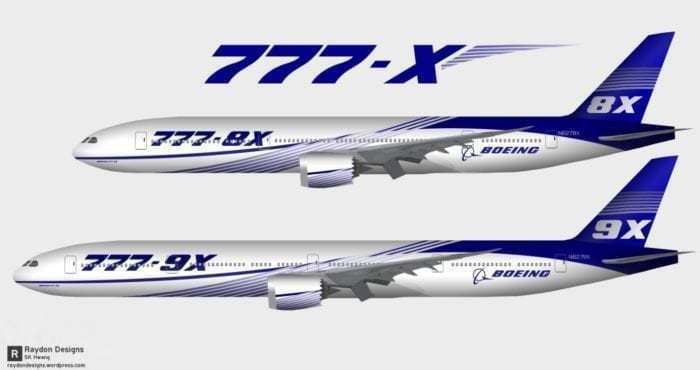 Now Boeing has announced the coming of Boeing 777-800 estimated to seat similar passenger capacity as the former and to be powered by twin engines that will work by same principles of electromechanics. Boeing have apparently achieved but regeneration here. Now Airbus A380 relies on the petromechanic strength of four Rolls Royce engine which are now factored as the cause of A380 failure. Antithetical A350 that is rumored as replacement for A380 and might run on similar petromechanic engine made by Rolls Royce. 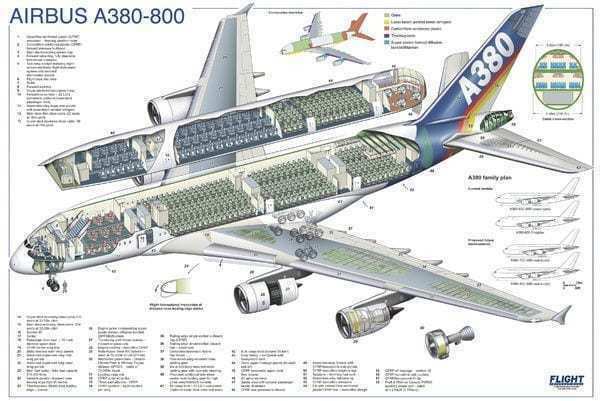 Mathematically, a fully loaded A380 seats 853 persons and burns roughly 350,000 litres of propane per trip. A350 will seat half of A380 capacity and burns half the same litres of fuel for similar range. This means that a “to and fro” trip of the forthcoming A350 equals a single trip of A380 at a ratio of 1 : 2. 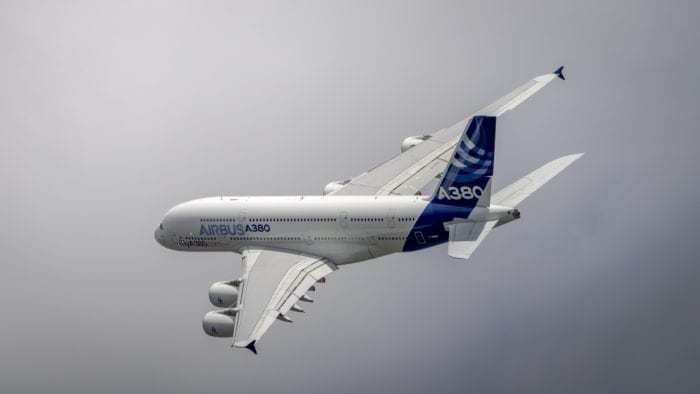 Practically Airbus have done nothing than manufacturing a smaller model of A380 that will fly less crowded route.